The well-known Uwe Reinhardt, an economics professor at Princeton University and specialist in healthcare economics, has died. 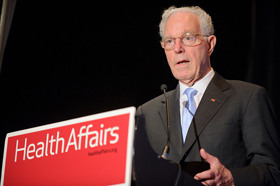 He was an advocate for a system of universal health insurance. He blamed a lack of what he called "social solidarity" as the reason why the United States has not adopted a national healthcare system. He sometimes wondered out loud why U.S. policymakers "hate poor people." In other words, despite living to the age of 80, he was never able to grasp the basic economic principles of supply and demand, and prices as signals, which a grasp of would lead easily to the understanding that universal healthcare does nothing but suffocate healthcare treatments and stifle healthcare innovation. Many of us will die sooner as the result of policies the government has adopted that Reinhardt supported. Reinhardt served on the governing council of the Institute of Medicine and on the Physician Payment Review Commission, the precursor of the Medicare Payment Advisory Commission. He was a member of numerous editorial boards, including NEJM, JAMA, Health Affairs, and was a regular contributor to the New York Times Economix blog. Uh-huh. Instead of positing an economic argument, the man deploys his righteous indignation and makes a moral judgment. He didn't die soon enough. "In other words, despite living to the age of 80, he was never able to grasp the basic economic principles of supply and demand, and prices as signals..."
All economists understand the superiority of the free market. They also understand that teaching it won't pay the bills.